The Magic Kingdom is simultaneously my favorite and least favorite Disney park. Most of the Magic Kingdom is meant for kids, but it’s also the heart of Disney, the heart of my childhood, the place where all the movies I loved as a kid come to life. But it’s the hottest of all the parks and the hardest in which to find shade. It was also the only park we couldn’t find a sit down restaurant to eat in. We did manage to find a place indoors to sit down, but it was one of those quick-order fast food type places. There are always large crowds at the Magic Kingdom, and usually full of kids, though that’s never detracted from my enjoyment of the park. I do wish it had been easier to find both shade and water though. There were a few moments I thought I might fall over. 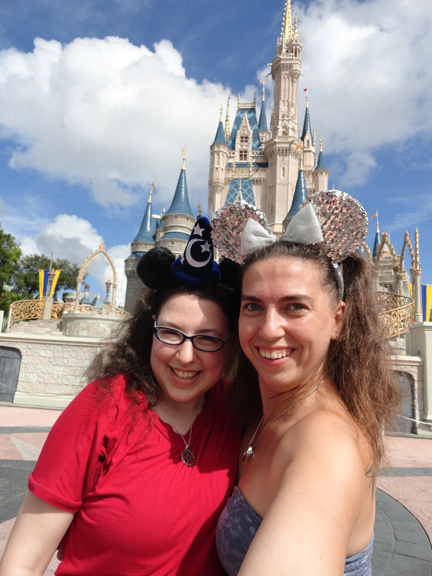 We took the usual pictures in front of the castle as we headed toward the center of the park. Rowena caught them setting up for a parade so we got prime positions for the street party parade and dance. We followed them right into the round-about in front of Cinderella’s castle and danced with Terk and Mickey. I’m not sure how we managed to jump and bounce in all that heat. 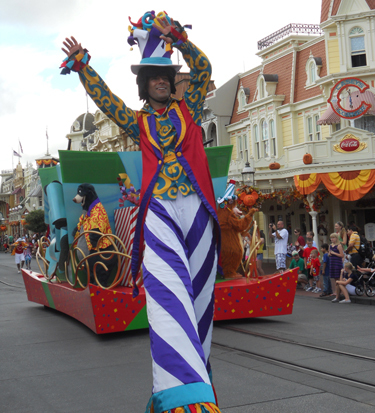 I’m even less sure how the actors in all those heavy suits and costumes (especially the poor guys in cotton on stilts) managed to dance in all that heat, but that’s the magic of Disney. Somehow they make you move to the sound of pure joy and you don’t even notice the sweat pouring down your face until it’s over. Our trip to the Magic Kingdom was also the day of our quest for the Jack Skellington top hat. I first saw it on our trip to Hollywood Studios but didn’t purchase it because it was early in the trip. 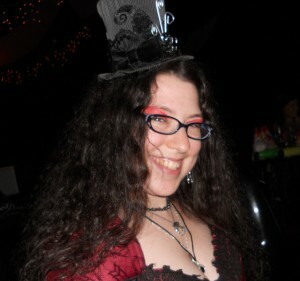 I love Jack (from Nightmare Before Christmas) and the top hat is just so gloriously steampunkish. By the time I knew for sure I wanted to take it home, we realized it was rare and hard to find. I spent a lot of time kicking myself for not buying it the first time I saw it. Luckily, after half a day’s mad searching, we found one outside the Haunted Mansion and I got to bring it home with me. We rode all the classic rides you usually visit the Magic Kingdom for. There’s the Haunted Mansion (and I got to walk through the new, extended line for the first time! ), Peter Pan, It’s a Small World and of course Pirates of the Caribbean, among others. There’s also a card game you can play at Magic Kingdom now (though the name escapes me). You get a group of cards (for free) from a stand near the entrance to the park. It includes a key, a map and several spell cards depicting Disney characters. Spaced throughout the park are mirrors (many of them are in shop windows). You hold up your key in the proper place (marked by symbols on the map) and you get a little piece of the story. It seems the Disney Villains have teamed up to take over the Magic Kingdom and you need to stop them. You hold up cards to cast spells and when you’re successful they send you on to another part of the park. It’s like one giant scavenger hunt and it’s pretty neat. We both encountered people who have been playing for awhile. By watching them we realized you can hold up two or three cards and the spells will mix to become more powerful. Rowena saw a girl who’s father works at the park with a book of cards. She held up one page in front of the mirror to cast all the spells at one time. If you complete the whole story you can get another round of free cards from the booth and you can initiate a new game (I think they grow more difficult each time or something like that), with more cards the reward every time you finish. Someone also told us near the end of the day you can go to the booth every morning and get more cards (wish we’d known that at the beginning of our trip). Unfortunately, there are nine mini-stories in each game and many of the mirrors have line-ups. It’s not the sort of thing you can complete in one day, though I think it’s perfect for locals with season passes. When we needed a break from the heat in the afternoon we grabbed some orange Dole Whip which a friend recommended. Toward the end of the day we noticed people walking around in costume. Once you’re past a certain age you can’t go to the parks in costume except during the Halloween parties (or so I’ve been told). We saw some amazing homemade costumes and even got permission from some of the participants to snap photos of their handiwork. Unfortunately, about the same time we noticed huge, heavy, grey clouds drifting in. We’d intended to go to Epcot again that evening, but decided it might not be the best course of action. 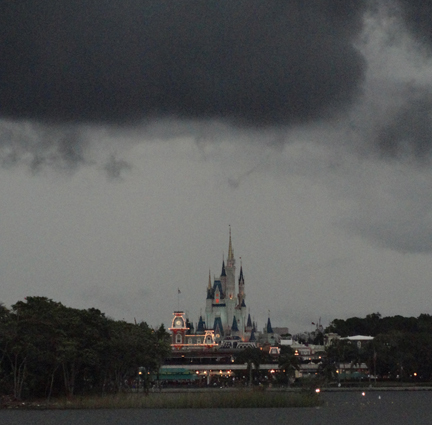 We fled to the parking lot and didn’t quite beat the rain (we snapped some crazy photos of the storm moving in over the castle while we road the boat out of the park). All-in-all, a spectacular end to a wonderful trip!